The Tusk 4 Point, 3 inch H-Style Safety Harness is a must-have for your UTV. 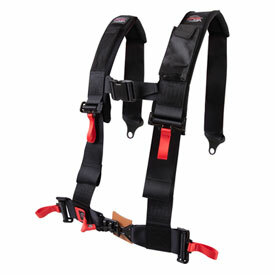 With The Tusk Harnesses, you can increase safety while out riding in your UTV. Equipped with adjustable waist buckles and shoulder straps, this harness will fit riders of all sizes comfortably. The shoulder straps are sewn to the waist straps making this harness very easy to buckle. It also comes with a mesh pocket for a flashlight or other accessories and a water resistant pocket to fit almost any cell phone or MP3 player. The sewn in shoulder pads prevent rubbing and chafing on the shoulders and neck while the adjustable sternum strap holds them in place. 4 Point 3 inch H-Style Safety Harness with sewn in shoulder pads provides safety and comfort for all types of riding. Shoulder straps are sewn to the waist straps, resulting in easier use. Equipped with adjustable lap buckles and shoulder straps to fit riders of all sizes. Mesh pocket on one shoulder pad for a flashlight and a water resistant pocket on the other shoulder pad to fit almost any cell phone or MP3 player. Sewn in shoulder pads provide comfort while an adjustable sternum strap holds them in place. Quality is awesome ! Very well built. Comfortable as much as it can get with a 4-point harness. Much safer then the original seat belts. The only thing you need to do is the metal clips on the belt that connects to the frame by the shifter you will need to heat it up and twist it 90 degrees or it does not fit through the holes where the old seat belt was. If you don't the belt is twisted. Easy fix though. Love the belts. Need to order two more for the back seats. Generally i would not write reviews. But for the price these harnesses are just as good as harnesses double the price. On top of that they forgot to send me the bypass plug for driver side. It was no issue tho as i sent one quick email and next thing i know i got a shipping confirmation on it with no questions asked. A little difficult to install, mostly due to my utv and me, but overall looks to be a very well made product. TheTusk 4 Point Harnesses are great quality,comfortable,nice looking,very reasonable price I would definitely recommend them FIVE STARS!!!!!! Great harness at a great price! Tusk always comes through with a great product at a fair price. These work and feel identical to many of the brands that are about 50% more expensive. Installation was a breeze aside from the factory buckles apparently being torqued down by Thor himself but that is hardly a fault of the Tusk harness. I would recommend these to anyone! I like the 4 point seat system by TUSK and I recommend it. -m-2018 POLARIS RANGER RZR S 900--easy installation. I did have to buy extra seat belt bolts, it's hard to install a 4 point system with hardware from a 3 point system. You will need to get use to to 3 inch seat belt over the thinner 3 inch OEM system.I DEFINITELY LIKE THE 4 POINT SYSTEM.It feels more secure. Comfortable , feel secure in the seat , pockets are nice to have. do they come with mounting hard were ? BEST ANSWER: depending on the machine you will receive what is needed to install. However on a lot of machine you will use the OEM hardware. What about the passenger side? BEST ANSWER: These are sold per seat. You'll have to change the size menu to passenger side. Ok, however, there is no passanger side in the drop down menu for the Kawasaki Teryx4. The only option I have/see is for the drivers side. I'm sorry about that. I do see that now, when selecting the Kawasaki Teryx 4 it will not bring up the Passenger side. I looked into this with our techs and they said you can just order 2 of the driver side harness. The only thing you will need to do is remove the seat belt override on the harness that is going on the passenger seat. Other than the seat belt override the harness is the same for the driver and passenger side. We apologize for the inconvenience this may cause. how do these mount wrap around bar or bolt to existing bracket behind seat ? BEST ANSWER: The lap belt will bolt to the machine and then depending on what machine you have, they will either wrap around the bar or bolt behind the seat. All harnesses will come with the brackets to bolt them in, but they can be removed if you wrap them around the bar for your machine. It only shows the driver's side harness. 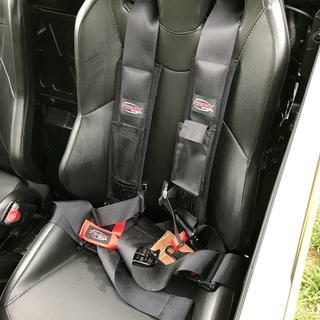 Is there a separate passenger side harness or one harness fits both side? BEST ANSWER: One harness fits both sides. Just look to see if it includes the seat belt override plug. You only need one of those, but the harness will work on either side. Super easy to install and they work great! 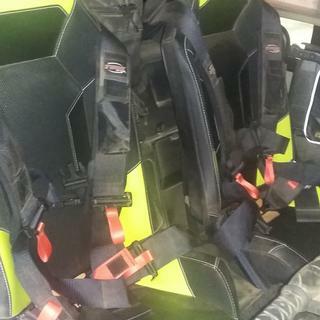 One harness will fit both sides the drivers side harness comes with a seat belt alarm over ride I already had mine straight wired and just bought to passenger side harness’s. As stated earlier both the passenger and driver side are the same, you order them separate. The driver side is slightly more because it includes the seat belt override. Harnesses fit both sides. Universal fit. 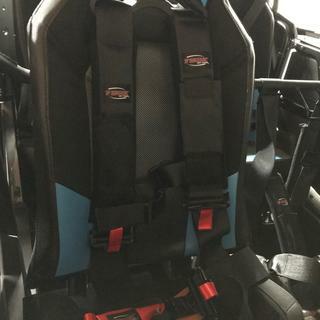 Also, i found that if you have a bar behind the seats it’s easiest to mount the harnesses to that, Hope this helps. Yes there is one for each side. Also be sure to check for the seat belt cutoff that should be included; it could be easily thrown out as it is so small. The drive side is the same as the passenger side. The override plug is included in the driver side option. Same harness fits both sides. I love them. Very comfortable and secure! Same fit either side, the red pull tab came off of mine off the bat. The same one will work on both driver or passenger side. They’re universal one fits either seat. Separate sides , left the right side. They are the same on both sides. The harness fits both sides. 2018 rzr 1000 xp worried about fitting me about 350 will it adjust to me? BEST ANSWER: I don’t have a Razor I have a CanAm. There is a lot of extra straps that I have to tuck inside. I would think that the harness would fit. If it doesn’t you could always send it back for a refund. I’m 6’1 and 280, about a 46” belly and had plenty of room for adjustment, about 5 or 6 more inches in either direction. Hope this helps. I am 6’4 250 and when I adjusted to myself there was about 2 ft worth of shoulder straps left over you shouldn’t have any problems. Hi, I love these. I had the same question you had as I weighed 250 when I purchased mine. They have plenty of room to adjust. You should have plenty of adjustment. I am also bigger and I end up tightening them down. It will fit for sure! Plenty of adjustability in these harnesses! Absolutely! I'm at 200 lbs and it has a LOT of adjustment left. Will these work for Rear Seats? I would like to get some to keep my kids more secure in the back. For a 2016 Kawasaki Teryx4. yes it should work fine. there is a lot of extra harness that comes with them. Yes if you have the roll bar behind the seats. Like the two seater has. Can you get them in blue? BEST ANSWER: Unfortunately, these are only available in black. I believe they're only available in black. Call Rocky Mountain ATV to be sure. But I have these and love them! Huge upgrade over stock. Can this be used on a 2018 Can Am X3 turbo? Yes I have them on my max x3 turbo. There is a option to enter your SXS info just above the picture of the harness. I had to make some slight modification for the belt connections. Do you make one for the Honda Pioneer 1000 5 passenger? Will the tusk seat harness work on my 2018 can am maverick x3 ? will they work on can am commander max front seats or do we need a mounting bar? BEST ANSWER: These fit the Commander models and will include everything you need in order to mount them. Is one available for the Maverick Trail? BEST ANSWER: Unfortunately we do not have one made for the trail. We offer different brands for that machine.